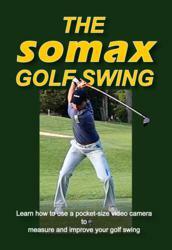 Somax Performance Institute (web: golf-swing-video.com), the leader in analyzing, measuring and improving the golf swing, is proud to announce their new golf swing DVD The Somax Golf Swing. The Institute, which has more than 1,000,000 views of its golf swing analysis videos on YouTube, has produced the first golf swing DVD that shows golfers step-by-step instructions for analyzing, measuring and improving the efficiency of their golf swing. "In 23 years of playing and six years of teaching, I have never seen this combination of distance and accuracy” says Jonathan Smith. “If I had taken more golf balls with me, I could have done this all day long.” Smith later played the front nine, hitting the center of the green from the tee 298 yards with his driver—and his new Somax golf swing. Golfers can see videos of his round at http://www.golf-swing-video.com Bob Prichard, Director of the Somax Performance Institute, says "We ask golfers: why try to imitate tour golfers when you can develop a better golf swing on your own with our new golf swing DVD?" Speed is the speed of your hips during the golf swing and also determines distance. Alignment is the stability of your spine angles during your golf swing and determines accuracy. With relaxing music in the background, golfers can watch on Disc Two an efficient Somax golf swing in slow motion in a receptive state and develop a better internal image based on the new Somax golf swing.